Amdavadi Get Ready for the Wedding Shopping because Cocktail Lifestyle Exhibition is back again with lots of Trendy New Collection. Cocktail Lifestyle Exhibition is organized by Waves Events. Cocktail Lifestyle Exhibition 2018 at Seema Hall Ahmedabad. Cocktail Lifestyle Exhibition will be held on 16th and 17th February 2018. 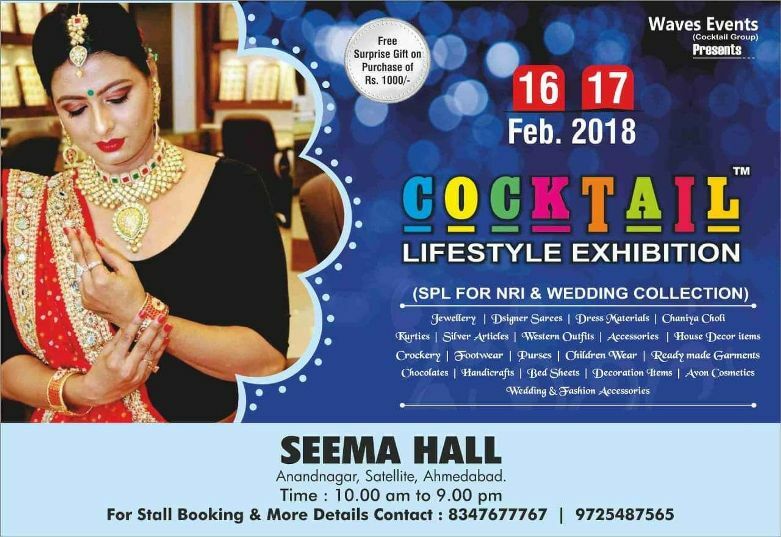 2018 Cocktail Lifestyle Exhibition Event is Special for NRI & Wedding Collection. Cocktail Lifestyle Exhibition Event in Ahmedabad is for two days. Cocktail Lifestyle Exhibition will showcase all type of wedding and lifestyle of branded products. Latest Trendy Jewellery, Designer Saree, Dress Materials, Chaniya Choli, Kurties, Silver Articles, Western Outfits, Accessories, Home Decor Items, Crockery, Footwear, Purses, Children Wear, Readymade Garments, Chocolates, Handicrafts, Bed Sheets, Decoration Items, Avon Cosmetics of Wedding & Fashion Accessories. Don’t Miss to be the part of the Cocktail Lifestyle Exhibition at Seema Hall Ahmedabad. Too many New Clothes and Accessories for Marriage Season. Do Shopping of lots of Branded Clothes and other Accessories. Book your stall in the Cocktail Lifestyle Exhibition 2018!!! !